Fiona Geddes, aged 15, undertook two weeks of work experience with London Catalyst this summer. She visited one of our grant recipients, the Healthy Living Club, and wrote this blog post about what she saw. The Healthy Living Club (HLC) is a community of volunteers, members of the club and helpers that all work together to decrease loneliness in a growing elderly population struggling with dementia. The volunteers for the club hold no pre-conceived ideas on what the elderly can or can’t do. This was demonstrated by the variety of activities for all different levels of mobility and accessibility. The HLC is very special in its sense of family. You cannot tell who is a volunteer and who is a member, as they all come together to enjoy each other’s company. Just one session at this club has shown me how it greatly decreases the isolation that many older people are made to endure. After a joyous session with the amazing chair-based keep-fit instructor Laurent, there were more and more happy faces coming out of their shell. Continuing both the singing and the exercise sessions some visitors came in and tried out some music memory classes. It was very interesting when the members of the club started to then open up about their childhood in the Caribbean and Nigeria. There was also a bundle of stories about their jobs such as nursing. This is a model club for social care that most would wish to be in every town across Britain. It gets people out of the house and also can create opportunities to make new friends and have a little fun in an environment accustomed to all the needs of people with dementia. 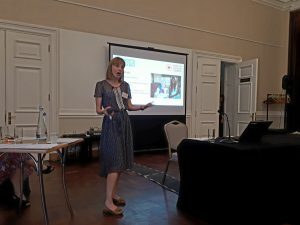 A week later, at London Catalyst’s AGM, the Healthy Living Club’s coordinator Simona Florio presented a very interesting talk about some of the problems that charities like HLC face. For example the endless requirement for evaluations and the stress because of the lack of money. This was a real eye-opener as when the second organisation (South London and North London Cares) gave their presentation it was clear that these problems were not a rarity. These thought-provoking presentations were followed by a conversation regarding the question “If you could wave a magic wand and transform social care provision in your neighbourhood, what would you change?” The group then put forward some very good ideas such as the NHS and social care and support groups could work together to find the best solution for the beneficiaries and to create awareness of the facilities and resources that can help you if you have a problem. Overall everybody agreed that a sense of community was one of the most important ingredients to make a successful social care support charity. 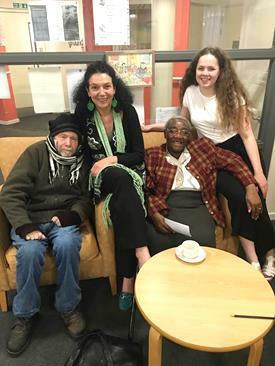 The friendship between the young and old neighbours in South London and North London Cares, and the sense of happiness between all the members of HLC, both show that this is what holds everyone together.